"Verily in this is a Message for any that has a heart and understanding or who gives ear and earnestly witnesses (the truth). (The Noble Quran, 50:37)"
"That is because they believed, then they rejected Faith: So a seal was set on their hearts: therefore they understand not. (The Noble Quran, 63:3)"
"Or do those in whose hearts is a disease, think that God will not bring to light all their rancour? (The Noble Quran, 47:29)"
"And We put coverings over their hearts (and minds) lest they should understand the Quran, and deafness into their ears: when thou dost commemorate thy Lord and Him alone in the Quran, they turn on their backs, fleeing (from the Truth). (The Noble Quran, 17:46)"
"Of them there are some who (pretend to) listen to thee; but We have thrown veils on their hearts, So they understand it not, and deafness in their ears; if they saw every one of the signs, not they will believe in them; in so much that when they come to thee, they (but) dispute with thee; the Unbelievers say: "These are nothing but tales of the ancients." (The Noble Quran, 6:25)"
"They prefer to be with (the women), who remain behind (at home): their hearts are sealed and so they understand not. (The Noble Quran, 9:87)"
Why is Allah Almighty claiming that the disbelievers' hearts do not understand and are full of disease? Allah Almighty classified them as what we call today "hard-hearted" people. "After (the excitement) of the distress, He sent down calm on a band of you overcome with slumber, while another band was stirred to anxiety by their own feelings, Moved by wrong suspicions of God-suspicions due to ignorance. They said: "What affair is this of ours?" Say thou: "Indeed, this affair is wholly God's." They hide in their minds what they dare not reveal to thee. They say (to themselves): "If we had had anything to do with this affair, We should not have been in the slaughter here." Say: "Even if you had remained in your homes, those for whom death was decreed would certainly have gone forth to the place of their death"; but (all this was) that God might test what is in your breasts and purge what is in your hearts. For God knoweth well the secrets of your hearts. (The Noble Quran, 3:154)"
"And that which is (locked up) in (human) breasts is made manifest- (The Noble Quran, 100:10)"
The Arabic word that was translated as "breasts" here is "sudoor". Sudoor is a plural of "sader". The more literal translation of sudoor is "chests" and not "breasts". Sader means a male's breast or chest, while "thadi" means a female's breast. A female's chest is also "sader". So, "breasts" in Noble Verses 3:154 and 3:154 is not an accurate translation. "Chests" is the accurate one. Anyway, in these Noble Verses, we see Allah Almighty talking about physical thoughts and "secrets" inside the hearts. Again, why is Allah Almighty talking about physical thoughts and "secrets" inside the hearts? Science had proven that the heart does impact the brain's thinking capability, and does also feed the brain thoughts and feelings that would control the perspective of the person. Traditionally, the study of communication pathways between the "head" and heart has been approached from a rather one-sided perspective, with scientists focusing primarily on the heart's responses to the brain's commands. However, we have now learned that communication between the heart and brain is actually a dynamic, ongoing, two-way dialogue, with each organ continuously influencing the other's function. Research has shown that the heart communicates to the brain in four major ways: neurologically (through the transmission of nerve impulses), biochemically (via hormones and neurotransmitters), biophysically (through pressure waves) and energetically (through electromagnetic field interactions). 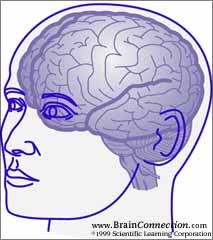 Communication along all these conduits significantly affects the brain's activity. Moreover, our research shows that messages the heart sends the brain can also affect performance. Taken together, the results of these studies demonstrate that intentionally altering one's emotional state through heart focus modifies afferent neurological input from the heart to the brain. The data suggest that as people experience sincere positive feeling states, in which the heart's rhythms become more coherent, the changed information flow from the heart to the brain may act to modify cortical function and influence performance. These findings may also help explain the significant shifts in perception, increased mental clarity and heightened intuitive awareness many individuals have reported when practicing the HeartMath techniques. The final two studies in this section are concerned with energetic communication by the heart, which we also refer to as cardioelectromagnetic communication. The heart is the most powerful generator of electromagnetic energy in the human body, producing the largest rhythmic electromagnetic field of any of the body's organs. The heart's electrical field is about 60 times greater in amplitude than the electrical activity generated by the brain. This field, measured in the form of an electrocardiogram (ECG), can be detected anywhere on the surface of the body. Furthermore, the magnetic field produced by the heart is more than 5,000 times greater in strength than the field generated by the brain, and can be detected a number of feet away from the body, in all directions, using SQUID-based magnetometers (Figure 12). Prompted by our findings that the cardiac field is modulated by different emotional states (described in the previous section), we performed several studies to investigate the possibility that the electromagnetic field generated by the heart may transmit information that can be received by others. 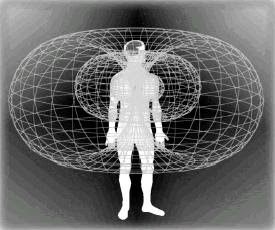 The heart's electromagnetic field--by far the most powerful rhythmic field produced by the human body--not only envelops every cell of the body but also extends out in all directions into the space around us. 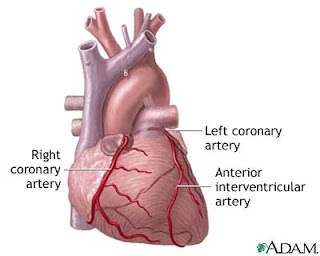 The cardiac field can be measured several feet away from the body by sensitive devices. Research conducted at IHM suggests that the heart's field is an important carrier of information. Thus, the last two studies summarized in this section explore interactions that take place between one person's heart and another's brain when two people touch or are in proximity. This research elucidates the intriguing finding that the electromagnetic signals generated by the heart have the capacity to affect others around us. Our data indicate that one person's heart signal can affect another's brainwaves, and that heart-brain synchronization can occur between two people when they interact. Finally, it appears that as individuals increase psychophysiological coherence, they become more sensitive to the subtle electromagnetic signals communicated by those around them. Taken together, these results suggest that cardioelectromagnetic communication may be a little-known source of information exchange between people, and that this exchange is influenced by our emotions. Rollin McCraty, PhD, William A. Tiller, PhD and Mike Atkinson. In: Proceedings of the Brain-Mind Applied Neurophysiology EEG Neurofeedback Meeting. Key West, Florida, 1996. THis figure Illustrates the entrainment that can occur between the HRV and EEG waveforms. The lefthand graphs show the time domain signals for the HRV and the EEG (brainwaves), while the righthand panels show the frequency spectra during the entrained state. Note the large peak at the entrainment frequency (~0.12 Hz) in both the HRV and the EEG while the subject is in the entrained state. Key findings: As people learn to sustain heart-focused positive feeling states, the brain can be brought into entrainment with the heart. Summary: This study examines in further detail the entrainment mode of cardiac function described previously in "Cardiac Coherence: A new noninvasive measure of autonomic nervous system order." In the previous investigation it was found that when the heart is functioning in the entrainment mode, there is a marked shift in the HRV power spectrum to the resonant frequency range of the baroreceptor feedback loop (around 0.1 Hz), and frequency locking between the HRV waveform, respiration and pulse transit time occurs. The present study shows that as individuals learn to maintain the entrainment mode through sustaining sincere, heart-focused states of appreciation or love, the brain's electrical activity can also come into entrainment with the heart rhythms. Figure 13, below, shows an example of entrainment occurring between a subject's HRV and the very low frequency band region of the electroencephalograph (EEG) recordings after the individual practices the Freeze-Frame intervention for 5 minutes. There is nearly a hundred-fold increase in power in the 0.1 Hz frequency range of the HRV power spectrum after the Freeze-Frame intervention and a correlated 4 to 5- fold increase in the EEG signal power in that same frequency range. Our present hypothesis is that a strong and sustained increase in baroreceptor system activity leads to greatly increased coupling between the heart (HRV) and the brain (EEG) via nerve conducted signals and increased coherence in the vascular system. The results of this experiment provide one example of how increasing coherence in the heart rhythms, by intentionally generating positive emotions, can alter brain activity. The brain's alpha wave activity is synchronized to the cardiac cycle. During states of high heart rhythm coherence, alpha wave synchronization to the heart's activity significantly increases. Investigation by Rollin McCraty, and Mike Atkinson (which was published in Proceedings of the Annual Meeting of the Pavlovian Society, Tarrytown, NY, 1999) explores further how the heart's activity influences that of the brain. In this pilot study, heartbeat evoked potentials were analyzed in ten individuals. 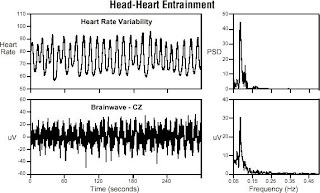 The analysis of heartbeat evoked potentials is a signal processing technique used to identify segments of the EEG (brainwaves) that are correlated to or affected by the heartbeat. In this way, it is possible to determine specific changes in the brain's electrical activity that are associated with afferent signals from the heart. The subjects' EEGs were recorded using electrodes placed along the medial line and the frontal sites. To determine which brainwave frequencies showed cardiac- related activity, the region of the EEG between 50 and 600 milliseconds post R-wave was then subjected to spectrum analysis. As a control, this procedure was repeated but instead of using the ECG as the signal source, an artificial, randomly generated signal with the same mean inter-beat interval and standard deviation as the original ECG was used for the time reference. It was found that the brain's alpha wave activity (8-12 Hz frequency range) is synchronized to the cardiac cycle. There was significantly more alpha rhythm synchronization when the real ECG was used for the signal source as compared to the control signals. Additionally, analyses revealed that brainwave activity at a lower frequency than alpha is also synchronized to the ECG signal. In the next phase of the study, they sought to determine if there is a change in the degree of alpha rhythm synchronization to the ECG during periods of increased heart rhythm coherence. In this phase, subjects used the Cut-Thru technique, an emotional refocusing exercise, a means of quieting inner emotional dialogue, instilling a positive emotional state and increasing heart rhythm coherence. Subjects' heart rhythm coherence and heartbeat evoked potentials were analyzed during a 10-minute baseline period, and again while they practiced the Cut-Thru technique for 10 minutes. There was a significant increase in heart rhythm coherence during the period that subjects used the Cut-Thru technique. Heartbeat evoked potential data showed that in this state of increased heart rhythm coherence, alpha wave synchronization to the cardiac cycle increases significantly. Signal averaging is a technique used to trace afferent neural signals from the heart to the brain. The ECG R-wave is used as the timing source for event-related changes in the brain's activity, and the resulting waveform is called a heartbeat evoked potential. 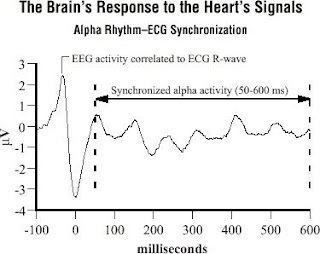 This graph illustrates an example of a heartbeat evoked potential waveform showing alpha activity in the EEG that is synchronized to the cardiac cycle. In conclusion, this study shows that the brain's activity is naturally synchronized to that of the heart, and also confirms that intentionally altering one's emotional state through heart focus modifies afferent neurological input from the heart to the brain. Results indicate that the brain's electrical activity becomes more synchronized during psychophysiologically coherent states. Implications are that this increased synchronization may alter information processing by the brain during the experience of positive emotions. Changes in alpha wave synchronization during high heart rhythm coherence. There was a significant increase in alpha rhythm synchronization to the ECG at most EEG sites during the use of the Cut-Thru intervention (high heart rhythm coherence). * p <.05, ** p <.01, *** p <.001. Rollin McCraty, and Mike Atkinson previous findings (above) indicating that states of increased heart rhythm coherence give rise to distinct changes in the brain's activity, we subsequently performed an experiment to determine whether these changes might have a measurable impact on cognitive performance. Further, they conducted another study to assess changes in cognitive performance associated with states of increased heart rhythm coherence. In this investigation, 30 subjects were randomly divided into matched control and experimental groups based on age and gender. Cognitive performance was assessed by determining subjects' reaction times in an oddball auditory discrimination task before and after practicing the Cut-Thru emotional self-management technique to increase cardiac coherence. In this test, subjects listened to a series of two different tones through headphones. They were presented with 300 tones, each with a 50-millisecond duration. Eighty percent of the tones were 1000 Hertz sine waves (standard), and the other 20 percent were 1100 Hertz tones (odd) randomly mixed in between the standard tones, spaced around two seconds apart. Subjects were instructed to push a button as quickly as possible upon hearing an odd tone. The interval between the presentation of the tone and the pressing of the button is the reaction time. Following a 10-minute baseline period, subjects were given a practice session to gain familiarity with pressing the button and identifying the different tones. This was followed by the first 10-minute auditory discrimination task. 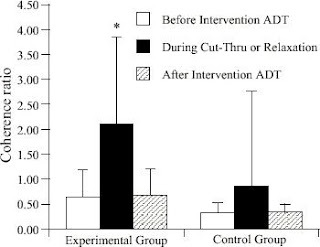 Thereafter, the experimental group subjects were asked to employ the Cut-Thru self-management technique for 10 minutes, while control subjects engaged in a relaxation period during this interval. Following this, all subjects performed a second 10-minute auditory discrimination task, the results of which were compared to the first. Subjects' ECGs, pulse transit time and respiration were continuously monitored throughout this entire experimental sequence. Heart rhythm coherence, derived from the ECG, was calculated for all subjects during each phase of the testing sequence. As shown in the following figure, there was a significant increase in heart rhythm coherence in the subjects who used the Cut-Thru technique that was not evident in the relaxation group. The figure shows changes in heart rhythm coherence across experimental conditions. 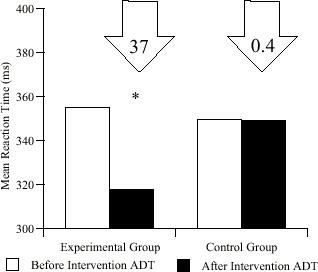 The experimental group used the Cut-Thru intervention in the interval between the two auditory discrimination tasks, while the control group engaged in a relaxation period during this time. (ADT = auditory discrimination task.) *p < .05 . As compared to the control group, subjects using the Cut-Thru technique demonstrated a significant decrease in reaction times in the discrimination task following the application of the technique, indicating improved cognitive performance. In addition, a significant relationship was found between the degree of heart rhythm coherence and reaction times. Increased cardiac coherence was associated with a significant decrease in reaction times (improved performance). The results of this study support the hypothesis that the changes in brain activity that occur during states of increased psychophysiological coherence lead to changes in the brain's information processing capabilities. Results suggest that by using heart-based interventions to self-generate coherent states, individuals can significantly enhance cognitive performance. The above figure shows mean reaction times for the experimental versus control group during the first (pre-intervention) and second (post-intervention) auditory discrimination tasks. By using the Cut-Thru technique to generate a state of increased heart rhythm coherence, the experimental group achieved a significant reduction in mean reaction time, indicative of improved cognitive performance. Note that control group participants, who simply relaxed during the interval between tests, showed no change in mean reaction time from the first to the second discrimination task. (ADT = auditory discrimination task.) *p < .05 . Rollin McCraty, Mike Atkinson, Dana Tomasino, and William A. Tiller argue in Proceedings of the Fifth Appalachian Conference on Neurobehavioral Dynamics: Brain and Values. 1997. Mahwah, NJ: Lawrence Erlbaum Associates that the concept of an energy exchange between individuals is central to many healing techniques. This concept has often been disputed by Western science due to the lack of a plausible mechanism to explain the nature of this energy or how it could affect or facilitate the healing process. The fact that the heart generates the strongest electromagnetic field produced by the body, coupled with our findings that this field becomes measurably more coherent as the individual shifts to a sincerely loving or caring state, prompted us to investigate the possibility that the field generated by the heart may significantly contribute to this energy exchange. 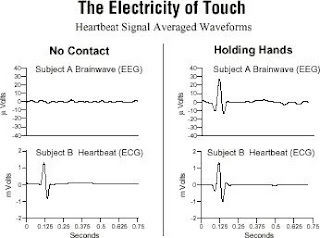 This study presents a sampling of results which provide intriguing evidence that an exchange of electromagnetic energy produced by the heart occurs when people touch or are in proximity. Signal averaging techniques are used to show that one person's electrocardiogram (ECG) signal is registered in another's electroencephalogram (EEG) and elsewhere on the other person's body (See Figure 18 for an example). While this signal is strongest when people are in contact, it is still detectable when subjects are in proximity without contact. Heartbeat signal averaged waveforms (figure above) showing a transference of the electrical energy generated by Subject B's heart which can be detected in Subject A's EEG (brainwaves) when they hold hands.